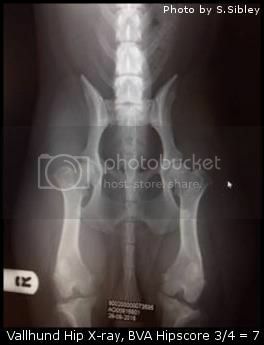 Hip Dysplasia (or HD) is where a dog’s hip joint does not form a perfect fit. As a puppy ages, it has a lot of growing to do before it reaches its final size. During this period of growing the hip joint may experience some abnormal growth, which is what causes this imperfect fit. This can range anywhere from only slightly off perfect to so severe the joint is unable to fit together. Once the dog has finished growing, depending on the degree of change in the hips, this can lead to the joints having more wear and tear and, over the years, leading to a dog that didn’t show signs of HD when young to start having symptoms when older. HD is a common orthopedic problem in all dogs and is both hereditary and environmental. While it is often more common in larger breeds it can be found in various sized dogs/breeds. Hip Dysplasia can be rather complex as it’s affected by both hereditary and environmental factors. There is no genetic testing for HD as it is thought that multiple genes may contribute to this, rather than just one or two. Instead breeding dogs can have their hips scored on how well they are formed, this will be explained below. Breeding multiple dogs with higher hip scores will likely increase the risk of puppies developing HD and breeding dogs with lower scores will likely decrease the risk. However as environmental factors also contribute to HD it is possible to have puppies from parents with low scores develop HD as well as a puppy from parents with higher scores not developing HD. The environmental factors that are thought to affect HD include improper or unbalanced diet, being kept overweight, high impact/excessive exercise, injury and early neutering. These can all play their part on how a puppy’s hips may turn out. What are breeders doing about Hip Dysplasia? As explained above there is no genetic test for HD, however the Kennel Club and the British Veterinary Association came together to create a scheme where owners and breeder can have their adult dog’s hips x-rayed and sent away for scoring. While any vet can take the x-ray, some breeders will travel to use more experienced vets as the dog must be positioned just right to be scored properly and improper placement will make scoring harder and may even be refused. Once an x-ray has been taken, it is sent to the BVA where a panel will look at nine different points on each hip and give it a score on how close to perfect it looks on the x-ray. The lower the score the closer it is, with the lowest score being 0 and the highest score being 53 per hip. These two hips scores are added together to get the total score, which can range up to 106. Results are given for both hips and the paper work will break this down further, showing what each point on the hip scored. The results will also be displayed on the Kennel Club Health Test Finder and will show the score for both hips together and singular. For example, it may look like this: BVA/KC Hip Dysplasia Scheme 3/2 = 5. This would be a total hip score of 5 with the left hip being scored 3 and the right scored a 2. So once a breeder has scored their dogs, they will then use this score when looking at potential breeding partners, along with all the other things a breeder may consider such as other health test results, temperament, the pedigrees, conformation, working ability etc. The idea is for breeders to aim to lower the scores over the generations. We are very proud to say that all club members are required by our code of ethics to have their breeding dog’s hip scored. Due to the combined efforts of the breeders of Swedish vallhunds in the UK , our breed's average scores have continued to lower over the years. How is Hip Dysplasia Diagnosed and Treated? As HD can vary in its severity, the symptoms a dog displays can also range from a change in gait (movement), obvious lameness, unwilling to exercise, stiffness, trouble getting up and pain when the joint is moved. First your vet will likely give your dog a physical once over, where they stretch and move the legs to check for pain or reduced movement. Then, if HD is suspected, they will take an X-ray to check the formation of the hip joint. The will confirm whether the dog has Hip Dysplasia or not and how mild or severe it is. Treatment will depend on how mild or severe the case is, with cases ranging from only requiring management of weight/exercise with joint supplements to requiring pain and anti-inflammatory treatment. In more severe cases vets may advise surgery. What can puppy buyers do? When looking to add a Swedish Vallhund puppy to your home, you should only get a puppy from a litter where the parents have been hip scored. Your breeder should be happy to show you the result certificates of both mum and dad. You can also check the results online, using the Kennel Club website. Keep your dogs at a healthy weight and avoiding high impact exercise while young pups are still growing is also good advice. If you wish, you could also have your adult Vallhund hips scored, even if you don’t plan to breed. Providing they are microchipped and you have their KC registration document, their hip score will be added to the breed’s records and used to calculate the breeds mean score. 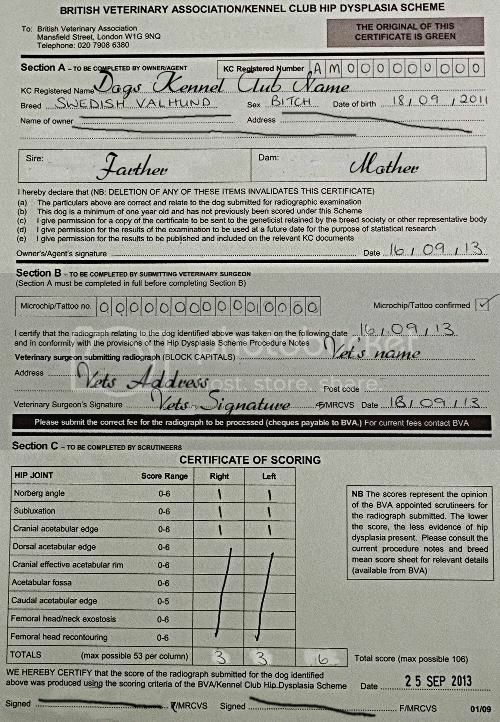 Below is a copy of the certificate a hip scored dog will have.